Perception is everything. How we see the world and the people around us is subjective to our point of view. But have you ever wondered what it would be like to, instead of walking in someone else’s shoes, to see through someone else’s eyes? In No. 11 Production’s The Eyes of Orbach, two men do just that. Only their lens happens to be legendary actor Jerry Orbach’s eyes. Inspired by the New York ad about Orbach’s factual donation of his eyes, two New Yorkers who are in need of new eyes are given new sight on love, happiness, and life. Billy and Paul are the newfound recipients of new eyes. After happenstance landed them at the same bar at the same time, they lock eyes and form an instant connection. From connection comes love, and like every love story, it has its ups and downs. Along the journey, we meet their friends, discover their ambitions, and watch how one person can really change the way you see the world and yourself. The script was a big ol’ metaphor that, despite being so present, wasn’t bashed over your head. Perhaps if the play was presented as a drama, you would go palm to face with every vision or eye pun, but fortunately this is a romcom and we forgive that. That being said, the play at times was borderline kitschy. In addition to the new perspective device set up, Billy and Paul also happen to see what Jerry saw, which happened to be a lot of song and dance. This allowed for a ton of Orbach related jokes, that if you knew Orbach’s body of work, allowed for some hearty laughs. Additionally, the play landed some extra laughs with the abundance of NYC insider jokes. From Dr. Zizmor to Dan Smith, you name it, Billy and Paul saw it. However the bit with the Showtime Dancer on the subway could not have come at a worse time. The dancer was front and center with the iconic overbearing music as Billy and Paul were revealing the key Orbach eye plot line. The heart of the story was about Billy and Paul falling in love. Was their love at first sight simply because they could see themselves in the other person? There was a big a narcissism, and added humor, as both leads, Steven Conroy and Scott Raymond Johnson, looked like they could be twins. Beauty is in the eye of the beholder, and no ones more beautiful than yourself! 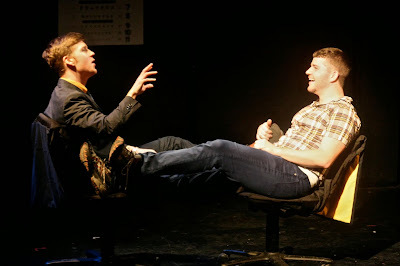 Conroy and Johnson had impeccable chemistry as Paul and Billy respectively. You couldn’t help but falling for their relationship. Conroy was the heart while Johnson was the rock. Johnson’s Billy was resilient and wanted him to come to his senses during his whacky nightmare. While Billy and Paul were the focal point of the play, there were some other key performances. Julie Congress as the Eye Doctor was a wonderful eye into this world. She was fun and playful in her omnipotence. Marie Claire Roussel as Iris was a spitfire. Though occasionally drawing too much focus, she added an extra bout of excitement. Director Ryan Emmons cleverly explored the world with simplicity. Some of the props were not as successful as others due to their clunkiness, but overall it worked. The device of breaking the fourth wall was smart and wanted to be incorporated even more. The integration of the audience would have helped remind us that this could be our New York love story too. Emmons’, who also served as sound designer, only downfall happened to be the sound design. Overall, the soundtacked was overpowering and distracting at moments. While it evoked the romcom feel, it just didn’t mesh properly. The Eyes of Orbach is the perfect date night theatrical romcom with a helping dash of insight. With a little more work and stability, The Eyes of Orbach will have a future.